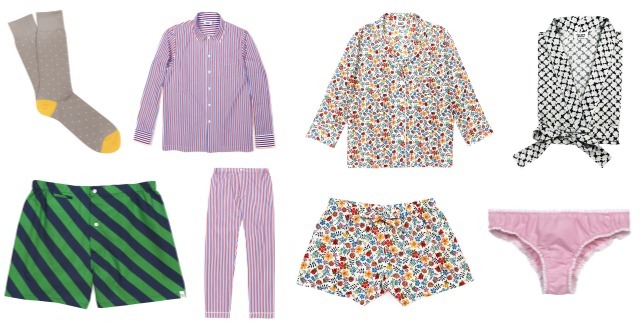 This week's spotlight falls on Andy Spade (of kate spade, Jack Spade, Partners & Spade) and his new line of pajamas, Sleepy Jones. 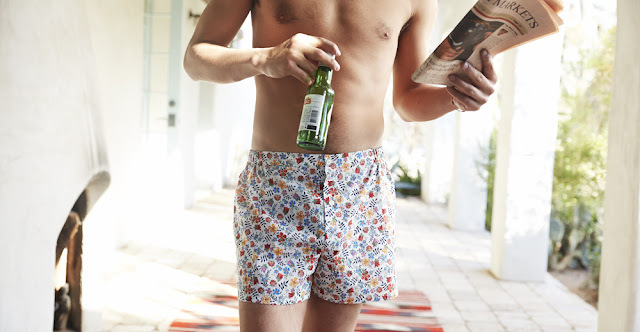 Inspired by the lifestyles of artists, writers and creative types, it's loungewear, sleepwear and underwear that you'll actually want to be seen in. Even more perfect than the selection of prints (preppy stripes and Liberty florals, natch) and piped solids is the brand's promotional imagery. Sleepy Jones is as much about the lifestyle as it is about the product, and it shows. A visit to the site is fun, enticing and yes, it makes you want to drop everything to pursue a life of leisure and endless weekends with your equally languorous soul mate. Let us not forget that this is Andy Spade we're talking about, so luxuriating in luxurious loungewear isn't exactly going to come on the cheap. Prices range from $24 for socks to $154 for a pajama top. It's casual decadence at it's best and in my mind is already topping my list for things to wear on that dream long weekend in The Hamptons, as I sip my coffee by the pool and listen for the sound of ocean waves. Yup, I want that (in a Napoleon Dynamite voice none the less). PJ tops for daytime wear sounds like something I would like to experiment with!